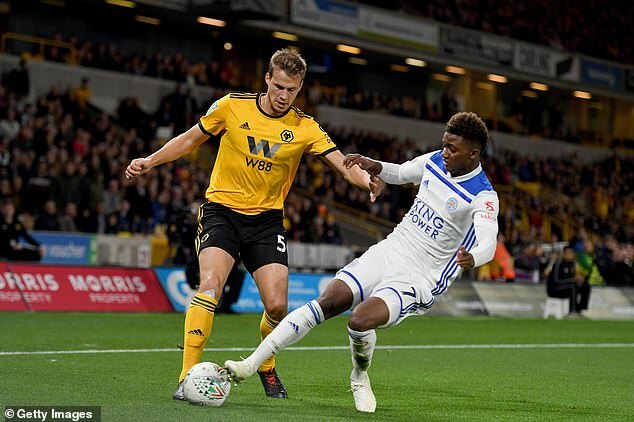 Demarai Gray will undergo a scan on Wednesday to discover the extent of a concerning ankle injury sustained during Leicester’s Carabao Cup victory at Wolves. The winger turned his left ankle in the turf while challenging Ryan Bennett for the ball in added time and initially believed he had suffered a break. Claude Puel said Gray saw his shinpad jutting out at an angle and thought it was bone. The 22-year-old was in agony on the grass, and received oxygen before being taken off on a stretcher with his leg in a brace. Puel said: ‘He will have a scan tomorrow morning. I hope of course it will not be serious. He is positive. Gray was seen leaving Molineux using crutches and wearing a protective boot on the damaged foot.